A Geonet webcam at Mt. Tongariro has captured spectacular footage of yesterday’s eruption, which lasted approximately 5 minutes, ejecting an ash column and plume some 3-4 km above the Te Maari crater. There have not been any reports of injuries or damage, beyond a light dusting of ash falling near the volcano. The volcano burst into life again yesterday without any warning; seismic monitoring stations near the vent recorded no activity before the eruption. Tongariro has been returned to an Alert Level 2 (i.e. 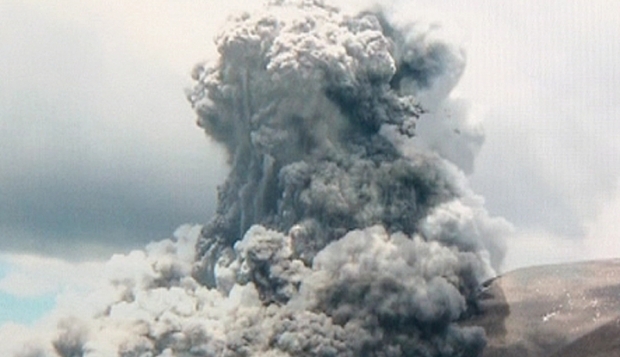 minor eruptive activity), with an aviation colour code of orange (minor ash ejection). Since yesterday’s eruption (the first since 16 August; that eruption was from the same vent) activity has been low, but GNS scientists believe that the risk of further eruptive activity remains high, with a significant probability of additional eruptions over the next week. In the late 1880s through to 1896, Tongariro erupted several times. If yesterday’s eruption is indicative of a similar eruptive sequence, we could be in for a prolonged period of volcanic acitivity at Tongariro. In addition, nearby Mt. Ruapehu has shown signs of increased pressure buildup beneath the Crater Lake over the past week, and GNS Science has warned visitors to the mountain that there is an increased likelihood of an eruption there as well. Ruapehu is currently on an alert level of 1 (i.e. signs of volcano unrest). Volcanologists remain uncertain as to whether or not recent activity at the two volcanos is linked, and Geonet is advising visitors to the area to stay out of designated restricted zones.